Recently, Chris and I were able to have a lunch picnic on a weekday. How did our schedule get so flexible? I’lll explain. For the longest time, it felt like Chris and I were living in a terrible career nightmare. We were both doing things that were paying well enough, but weren’t what we wanted to be doing, or where we wanted to be in life. And it goes without saying that we were in no place to have a lunch picnic on a weekday. We’re both creative people. Chris is a graphic designer by day, and by night he runs his own design company. I’m a college writing instructor by day, and by night I kind of just rant on the internet and occasionally write some fiction. Naturally, we’d both love to be in a position to focus on our creative pursuits 100% of the time, but that’s just not possible right now. What is possible right now is being content with where we are. And I’m not saying we settled for what we have. Far from it. Instead, we’ve worked to make our lives what we want them to be. Basically, I’m saying we have the lunch picnic now, but maybe next year, we’ll have the travel to world for fun and profit lifestyle. Where we are right now is just a step on that journey, but it’s so far from where we’ve come. In 2014, I was working for a company I hated. I would commute roughly an hour in the morning, sit at my desk doing menial tasks befitting an intern for 8 hours, and then commute roughly an hour home. Even though in all my employee performance reviews I stated that I would like more responsibility, I was never given any. I was also never actually trained in anything the company did. Instead, from my first day until I left, I was given minor editing tasks, or was asked to burn CDs for clients, or I would test software. This is what I did as a technical writer. And while I’m aware that “other duties as assigned” is a part of all job descriptions, it shouldn’t make up 100% of the job. So, I left and started my current job teaching. When I started, I didn’t have a full-time position, but I wasn’t going to be deterred by that. I knew it was more important for me to have something that I loved doing. Plus, I was relatively young. It wasn’t like I was making a big transition after being with a company for a long time. It wasn’t like I knew any industry incredibly well. In fact, the longest I’ve ever stayed at any one job has been 23 months. If you were to look at my resume, you’d see that I’ve hopped around from libraries to publishing to banking to defense contracting to teaching. I’ve also been given so much responsibility in my current position. And everyone in my department respects my opinion. In fact, I have not encountered one inferiority complex in my department since leaving that terrible job. (That was the biggest change for me, since the CEO at my old job basically turned his personal castration complex into the company’s mission.) On any given day, I can go to my supervisor and have an open and honest conversation, completely devoid of gossip and racism. (That shouldn’t be as novel as it is.) I can ask my coworkers their opinions, and they give them openly. We can all come together and share information in a very productive way. It’s amazing. But, perhaps the very best part of my job is the freedom — and ability to have a lunch picnic — that comes with it. I teach 5 classes a week, and I have office hours each week. But I don’t have to be at my desk all day. I can grade papers at home or at a coffee shop if I want. Recently, the back patio has been my spot of choice. Just me, Rosie, and my laptop. It’s been fantastic. Chris has found himself in a similar position lately. His company now offers flex time. He has changed his schedule so he’s working 9 hours Monday through Thursday, and he works a half day on Fridays. He can also start his day at 7 AM, instead of 8:30, which used to be the start time. This means that Chris has so much extra time in the afternoons and evenings to work on his company, which is amazing. And last Friday, we took full advantage of his half day and met at the park for a lunch picnic. It may seem small, but it means more than just eating food outside. 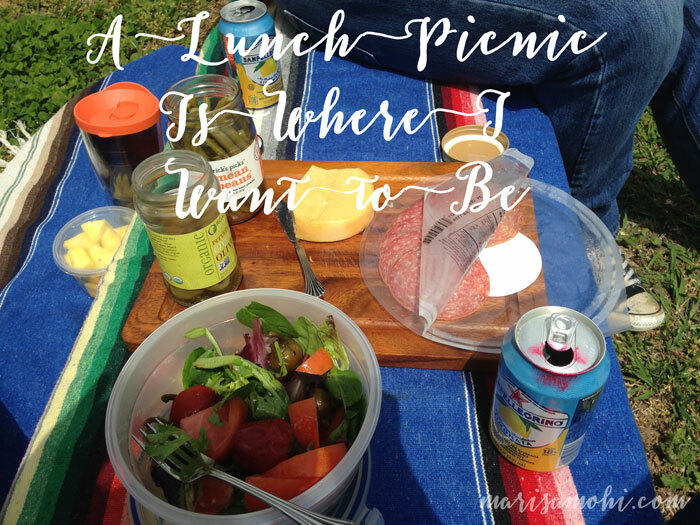 And it may not be where I want to end up, but a lunch picnic is where I want to be right now. I know what it means for your soul to be sucked dry by an employer. So to hear you so happy and consciously aware of the goodness around you is wonderful. I consider processed meat to be junk food, but I’m sure most people don’t feel that way. Other than that, the picnic lunch looks like it conforms to your intentions for April, so I guess congrats are in order. The lipstick on the San Pellegrino is a nice touch. Processed meat is probably junk, but I feel less guilty about eating it than say, a burger. Oh, and the San Pellegrino probably had way too much sugar but you have to live a little.